This morning after taking E to the bus with me, AB thought she’d visit our neighbour’s driveway. She even ventured all the way to his front steps. I asked if she was going to come inside with me or go live with Steve. After a few minutes, she changed her mind, claiming “Steve is a monster.” (Monsters are on her mind a lot right now, though seemingly not in a very scary way.) I assured her that Steve is actually a nice guy, but she opted to have breakfast with me anyway. I love her in this poofy powder-pink snowsuit. She also has a brown coat with leopard-spotted lining, which I have to admit is edgier… but gosh. I like the pink in spite of myself. what a cheeky little thing! reminds me of someone i used to often breakfast with! 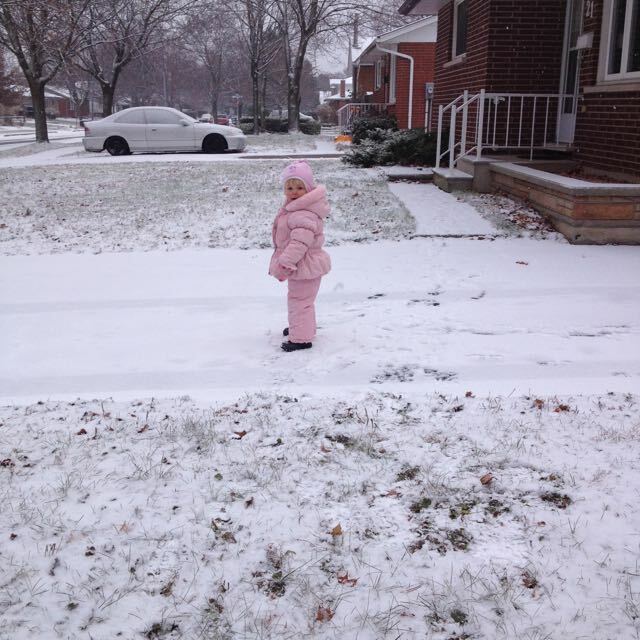 she had a pink snowsuit, too. Steve IS a nice guy. He probably wouldn’t mind having a new tiny roommate. You all have more snow! We don’t. No snowsuits here. Lovin’ pink – 7-year-old mini-Di!